Can the new top-level domains increase your keyword rank? Recently, while doing research for a client I came across some high-ranking custom top-level domains (TLDs) which were outranking their .com competitors in a competitive space. 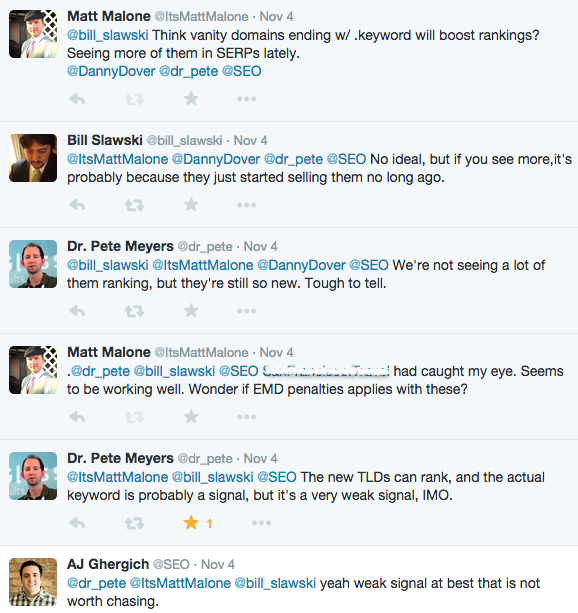 This got me thinking, are custom TLDs actually giving certain sites an SEO boost? I reached out to a few experts on the subject and while they were pretty convinced there is no SEO value, they all agreed vanity TLDs are just too new to know for sure. Google’s Matt Cutts has stated that the new TLDs won’t have an advantage over existing domains, but was unclear on whether keywords in the new domain extensions will act as a ranking signal. I strongly suspect they will play this by ear, until they know how each of the new TLDs is being used. In my opinion, exact-match domains are no longer as powerful without other signals to back them up, and it’s likely Google may lower the volume on some of the new TLDs or treat them more like sub-domains in terms of ranking power. In other words, they’ll probably have some value, but don’t expect miracles. Meaning if there are supporting signals to back up the keyword domain then they just might experience a boost – as little as it may be. Beyond SEO, custom top-level domains do help support brand awareness, location confirmation, or convey the website’s primary topic before a user even clicks through. Additionally, there doesn’t seem to be much of a concern for an Exact Match Domain penalty either. Go ahead and use them if you want, but they’re too new to say for sure if there’s real SEO value to them yet. At least in terms of boosting keyword rank. They seem to perform fine, but probably no better than using a .com with an appropriate semantic URL structure. What are your experiences, have you used a custom TLD for targeting specific keywords or verticals in your business? We’d love to chat more about it in the comments.